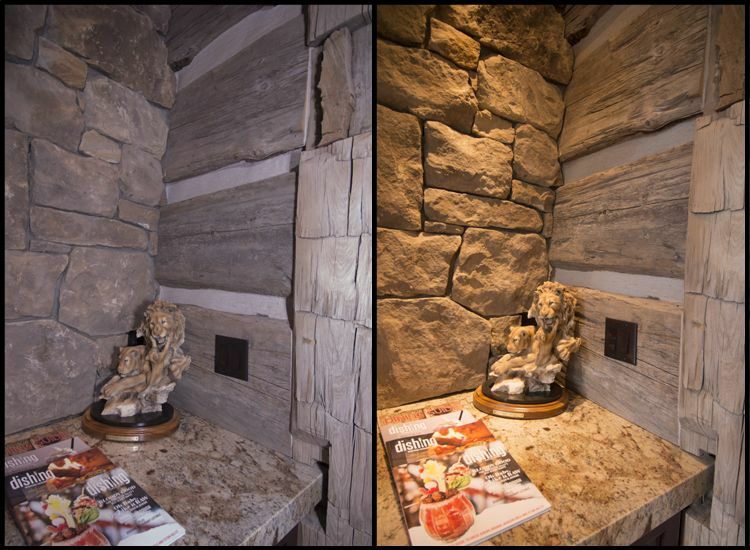 Do you prefer the barnwood in Photo #1 or Photo #2? How about the hand-hewn siding in Photo #3 or Photo #4? It turns out that Photo #s 1 and 2 are photos of the same product (in fact, the same boards) taken at the same time but with different cameras. Photo #s 3 and 4 are photos taken of the same corner/wall with the same camera but with different lighting (flash) and other settings. Photos are impacted by the camera and other equipment, camera settings, location, season of the year, time of day, weather conditions, distances, angles, lighting (natural and artificial), photographer (skill, taste, personality,...), photo editing/adjustments, conversion tools that are used when the photos are pulled into Trestlewood's photobase, etc. From Trestlewood's perspective, (1) a perfect photo is a photo that perfectly captures reality, that 100% accurately portrays the coloring, texture and other characteristics of one of our products and (2) such a photo doesn't exist. We sense that there will always be subjective factors that make it difficult to define a perfect photo, let alone achieve it. Our experience suggests that if you ask two capable photographers to produce a photo that best captures a timber or board's true character, you will end up with two photos with noticeable differences. To complicate matters further, keep in mind that even if Trestlewood somehow stumbled into a perfect photo of a timber, board, or finished project, (1) this photo would display differently on different monitors; (2) finished project photos often display products that have been sorted, coated/stained, or otherwise changed after leaving Trestlewood's hands; and (3) no two timbers or boards are exactly alike (meaning that a perfect photo of a timber or board does not provide a perfect feel for the range of characteristics in the product line in general.) In short, we believe that one of the most important steps in effectively using product photos is to recognize that THERE IS NO SUCH THING AS A PERFECT PHOTO. We have found that it is more practical (and produces better results) to focus on making a lot of imperfect photos available than to throw a lot of resources into producing the one perfect photo. We believe that reviewing a broad sampling of photos (especially when combined with other product information, like specification sheets), will generally provide a decent feel for the range of characteristics in a given product line. Of course, in order for you to benefit from this approach, it is important for you to LOOK AT A LOT OF PHOTOS.